ReportCaster is a scheduling and distribution application that centralizes the execution and distribution of WebFOCUS reports, the contents of URLs, and files. ReportCaster supports multiple administrators and provides a single point of control for managing information distribution within an organization. Each utility will create a utility_name.log file in the ...ibi/WebFOCUS8x/ReportCaster/log directory, where utility_name is the name of the utility. When using the Release 8.1 Version 05M Upgrade installation, see the WebFOCUS Upgrade Considerations manual for post-installation information. You can restrict the distribution of a report (.fex), through scheduling, to the Report Library only. 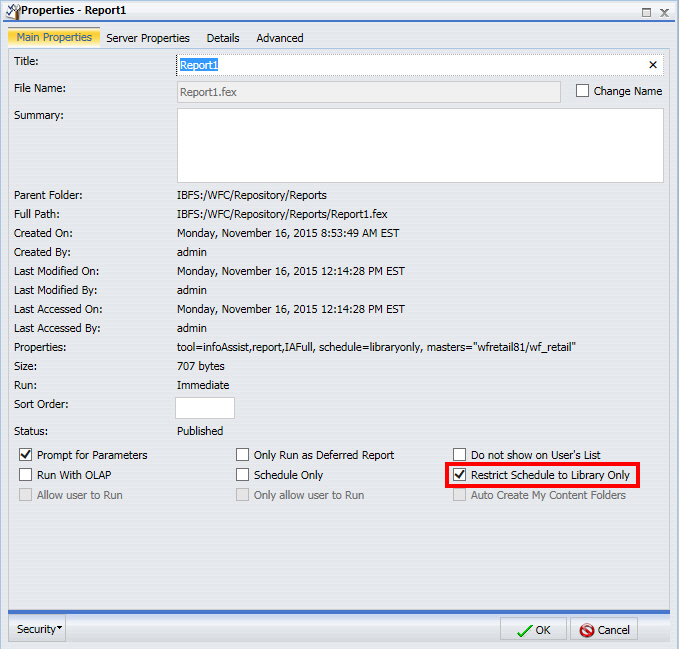 To enable the functionality, right-click the report in the Resources tree and click Properties. The Properties dialog box displays, as shown in the following image. 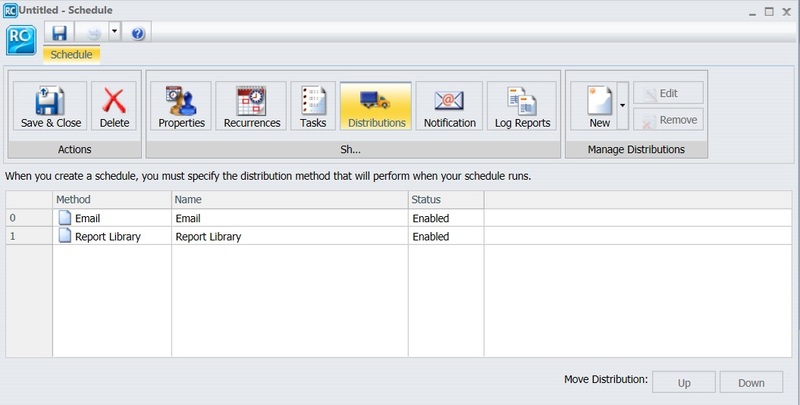 The Restrict Schedule to Library Only option sets the distribution restriction when creating a schedule. The Distribution Server continually evaluates and enforces the distribution restriction to the library (for those reports that are restricted) by not distributing the report. As of Release 8.1 Version 03, the Distribution Server processing uses the IBFS system to submit scheduled jobs to a Reporting Server so that the processing for interactive and scheduled requests is consistent, including support for WebFOCUS group security. 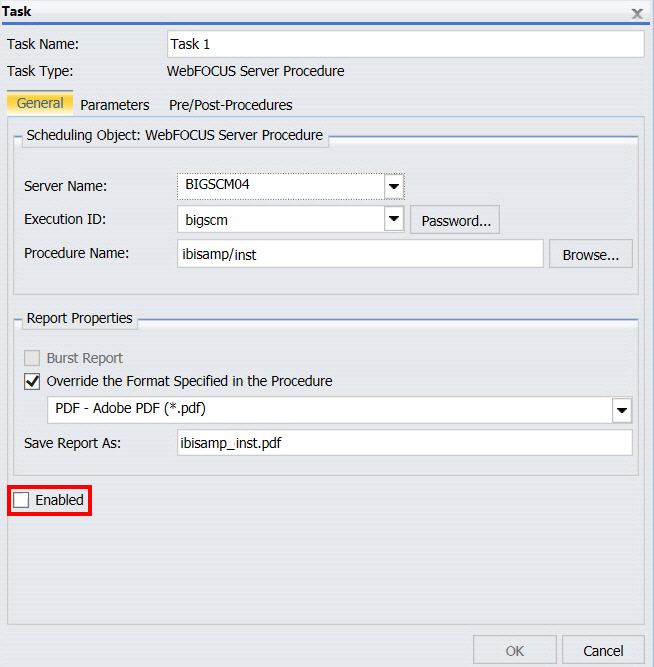 This consistency in processing includes the Distribution Server using the Reporting Server, referred to as Data Server in the ReportCaster configuration, host, and port definitions defined in the WebFOCUS Client configuration. All other Data Server definitions required for Distribution Server processing, including the Maximum Threads setting that defines the number of scheduled jobs the Distribution Server can be submitted to a Reporting Server, remain in the ReportCaster configuration. Select the Data Server option in the tree of the ReportCaster Console Configuration tab to create and maintain the Data Servers defined in the ReportCaster configuration. Due to the integration of Reporting Server (Data Server) definitions, a different host and port cannot be defined for a Data Server in the ReportCaster configuration tool. A future release will provide the ability to define alternate Data Server host and port values for scheduled jobs. Contact Customer Support if you would like to be updated when the ReportCaster alternate Data Server host and port functionality is available. As of Release 8.1 Version 03, two new internal variables have been added. The first variable, &DSTSCHEDID, is an ID that uniquely identifies the schedule. The second variable, &DSTSCHEDDESC, is the title (description) of the schedule. For more information on all ReportCaster internal variables, see ReportCaster Variables in the ReportCaster manual. In the ReportCaster Explorer, two new icons have been added to control the display of folders. The Show only folders with content option allows you to display only folders that contain content. This option is shown in the following image. If you have selected the option to Show only folders with content and subsequently want to restore the display of all folders, click Show all folders, as shown in the following image. A new configuration setting, Set FOCEXURL/FOCHTMLURL in the schedule procedure, has been added in the ReportCaster Configuration tool. This setting is selected, by default, and is highlighted in the following image. If this setting is not selected, the Distribution Server will not set the value of FOCEXURL or FOCHTMLURL for a scheduled procedure. Therefore, when cleared, if FOCEXURL or FOCHTMLURL is already set in the edasprof.prf file, this setting remains in effect, unless it is overridden in the scheduled procedure. For more information on the FOCEXURL and FOCHTMLURL settings, see the Developing Reporting Applications manual. Populate all required fields for the selected method. Populate all required fields for the selected task. For specific guidance on creating tasks, see the Creating a ReportCaster Schedule in the Advanced Scheduling Tool chapter in the ReportCaster manual. You can use parameters (amper variables) to populate fields in the Basic and Advanced Scheduling tools. The following image shows an example of the email distribution option. These include, but are not limited to: Save As, Email Zip file name, and Zip file name. Note: You can use parameters (amper variables) when specifying settings in a schedule. These parameters can be system variables, such as &DATE or any amper variable for which a value is returned by the Reporting Server when the scheduled procedure is run. If a value for a parameter specified in a schedule is not returned by the Reporting Server when the procedure or procedures run, the schedule will fail with a No report to distribute error. For more information on using parameters, see Distribution Options in the Advanced Scheduling Tool in the ReportCaster manual. Distribution Server traces can be enabled or disabled from the Server Status tab of the ReportCaster Console. To turn Distribution Server traces on or off, click the View Trace button, and click Turn On Trace or Turn Off Trace, as shown in the following image. Note: This option tracks traces for the Distribution Server separately from Job traces. You do not need to turn on job traces to see distribution server traces. You can set default Library Expiration options in the Report Library folder, which is located on the Configuration tab of the ReportCaster Console. The default settings control the expiration of library reports, and allow you to specify a number of versions, days, weeks, months or years by which library reports can be set to expire. You can also disable the option for Never Expire, which controls the option to select this setting when scheduling a report using the Report Library option. 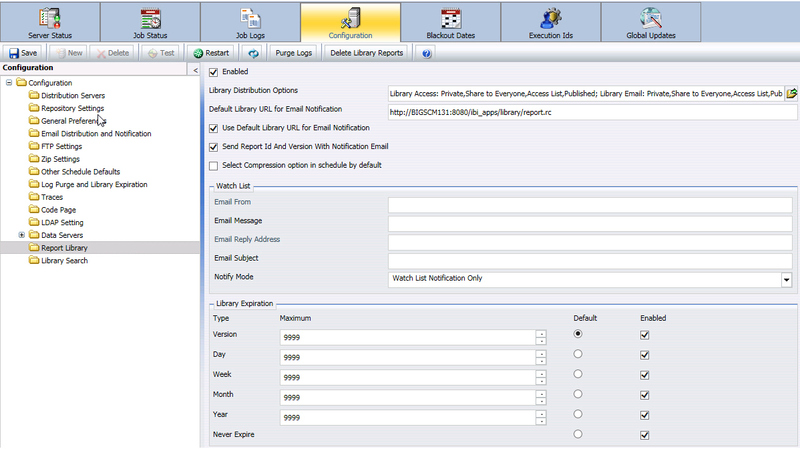 All Library Expiration options are enabled by default, as shown in the following image. You can view log and trace information for the daily and on-demand Log Purge and Library Expiration jobs. You can view purge logs and traces using the Job Logs tab in the ReportCaster Console. You can view log and trace information, open job logs, delete job logs, refresh job logs, or access related help for job logs on the Job Logs tab. To access a listed job for which you want to view logs or traces, click the Auto Log Purge folder or the Library Expiration folder, which are located in the system folder. Once you select a job, click View Log or View Trace, as shown in the following image. Changing the password of an FTP user applies to all schedules that use that user ID for that FTP server and schedule owner. As of Release 8.1 Version 03, you can perform an on-demand purge of your logs using the Purge Log option on the toolbar of the ReportCaster Configuration tab in the Administration Console. You can also specify a number days (past) from which to purge logs. The Delete Library Reports option, which is adjacent to the Purge Log option on the toolbar of the ReportCaster Configuration tab, provides the on-demand capability for deleting expired library reports. You can accept the default, which is to purge expired library reports, or select the option to Purge all Library Reports Older Than, which allows you to specify a date for which all reports prior to this date will be deleted. You can use the drop-down menu to enable a calendar, or enter the date manually. Both Purge Logs and Delete Library Reports offer the ability to specify an option for traces: Default Traces, No Traces, or Trace On. As of Release 8.1 Version 03, the Enable Brief Notification Only check box is available in the Email Distribution and Notification folder, under ReportCaster Configuration. This setting controls whether Full Notification is available as a scheduling option. When this check box is selected, you can only select the Brief Notification option when you schedule a report. Note: If a schedule is created before Full Notification is disabled, when the schedule executes, a Brief Notification will be sent, and a warning will be displayed in the schedule log. The Enable Brief Notification Only check box is shown in the following image. The Distribution Server now has separate job queues for each Reporting Server, as well as an additional queue for tasks that do not require a Reporting Server. Therefore, there will always be at least one job thread available for each Reporting Server, in addition to at least one thread for non-server based jobs. No one Reporting Server can have all of the available job threads consumed by jobs associated with that server. Each Reporting Server is allocated job threads equal to the total number of connections available for that Reporting Server. The Maximum Threads setting is now the total number of threads for each Reporting Server, in addition to the number of threads allocated for remaining tasks. You can publish schedules from the tree in ReportCaster. A published schedule will be visible to all users with access to the folder in which it resides. The right-click options that appear on the schedule will depend upon the privileges of the user that is signed in. For example, a user with the Run privilege will be able to run the published schedule. When a published schedule runs, it runs as the creator of the schedule and not as the signed in user that initiated the run. You can create group owned schedules from the tree in ReportCaster. A group owned schedule will be visible to all users within the selected group that can access the folder where the schedule is located. The right-click options that appear on the schedule will depend upon the privileges of the user that is signed in. For example, a user with the Run privilege will be able to run the group owned schedule. When a group owned schedule runs, it runs as the creator of the schedule and not as the signed in user that initiated the run. In the tree, select a schedule for which you want to establish group ownership. Select Security and then click Owner, as shown in the following image. On the Set Owner dialog box, click Group, as shown in the following image. You can encrypt the communication between the ReportCaster application and the ReportCaster Distribution Server with an SSL Certificate. To enable this functionality, click Configuration on the ribbon in the ReportCaster Console and select the Distribution Servers folder, as shown in the following image. Enable. Select this check box to encrypt the communication between the ReportCaster application and the ReportCaster Distribution Server. After enabling secure communication and saving the changes, you must manually restart the ReportCaster application and the ReportCaster Distribution Server. SSL Certificate. A default SSL Certificate is supplied by the installation procedure. You can optionally replace the default certificate with your own certificate by replacing the default value in the tool. PPTX for PowerPoint 2010 (*.pptx). PPTX Template for PowerPoint Template 2010 (*.pptx). Note: These formats use the Open XML format. The formats are available in the Basic Scheduling tool, the Advanced Scheduling tool, and the API. These formats are disabled by default. However, you can enable them by accessing the General Preferences Settings folder in the Configuration tool of the ReportCaster Console. A View Trace button has been added to the Server Status, Job Status, and Job Logs tabs in the ReportCaster Console. This function enables administrators to view trace information in the scheduler.log, main.trc, reader.trc, console.trc, and other trace files. When multiple scheduler.log files are created on the same day, ReportCaster creates a unique file for each instance, using a date and time stamp. The following format is used: scheduler_DD-MM-YY_HH-MM-SS. The scheduler.log trace files are always created in the /ibi/WebFOCUS82/ReportCaster/log directory. The ReportCaster Explorer toolbar has been modified to include two new icons: Show the preview pane and Show version list pane. When a Library report is selected in the ReportCaster Explorer pane listing, you can click the Show version list pane icon to view the available versions of the report at the bottom of the dialog box. When you click the Show preview pane icon, the selected report will be previewed in the right pane that displays. The following image shows the ReportCaster Explorer with the versions and options available for the Product Packaging and Price Library report. 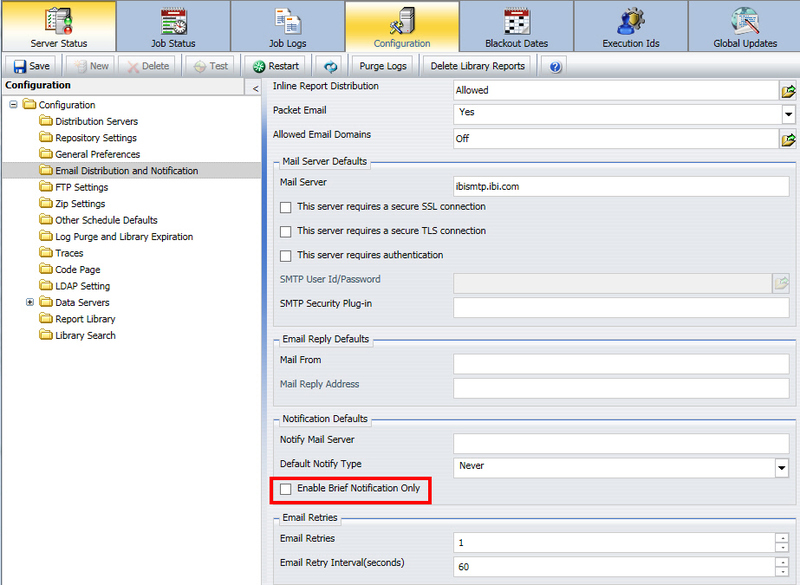 In the Distribution dialog box, Multi-factor authentication has been added for FTP Server distribution. When customizing settings for FTP Server information, you can select the Public Key and Password (Multi-factor) authentication option. This option indicates that the server requires authentication with a user ID and password. You can configure your default FTP Server to use the SSH File Transfer Protocol (SFTP) in the FTP Settings folder in the ReportCaster Configuration tool, as shown in the following image. When working with an existing schedule, you can disable one or more tasks within that schedule. You can also create a new schedule with multiple tasks and then disable one or more of those tasks, as needed. An administrator can unsubscribe other users from a library report. This feature allows administrators to globally override watch list settings created by other users. For Windows, this feature can be enabled by running the unsubscribe.bat file, located in the \ibi\WebFOCUS81\ReportCaster\bin directory. For UNIX, this feature can be enabled by running the unsubscribe shell script, located in the /ibi/WebFOCUS81/ReportCaster/bin directory. You now have the option to remove trailing spaces from reports distributed in a text format. Activating this setting makes text reports display in a more compact format by reducing the overall text width. Your administrator needs to add the following setting to the Administration Console Custom Settings text box: IBIWF_trimreport=YES. You can also apply this setting to affect specific report formats, for example, IBIWF_trimreport=WP.